If you're like me, maybe you can only vaguely recall the last time you paid proper attention to the offerings of your local Toronto Public Library. 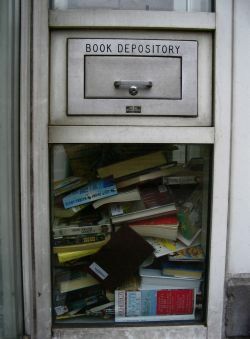 It's easy to feel that, in this era of filesharing, torrents and eBooks, that the library's inherently finite selection and old-fashioned real-world cement is a tad obsolete. Maybe the last time you did stop by, you too found yourself in the music collection flipping through a random selection of releases and having devious little pirate fantasies about borrowing them all out, firing up your CD burner and doubling your disc collection. Maybe you've even gone through with it and hung onto the copies long enough to realize that Navy Blues wasn't worth borrowing in the first place. Well if you've been assuming the library into irrelevance too, there's a very good chance that you've missed out on the work they've done to get with the times and the fact that the library now offers eBooks, audio books, movies, music and other direct-download content through their website. It's easy to overlook the "Download Books, Music and Videos" link now sitting near the bottom of the main library homepage, but it opens you up to a world of free content and opens the dusty old library up to a new technological and cultural age. Well, assuming you've got a Windows PC and no major misgivings about DRM. So, admittedly, this is not exactly the Free Software Foundation's idea of a high-tech free-content utopia. If you're a non-Windows user or don't want to install the required Media Player DRM update, you won't be able to use the OverDrive software that handles the DRM-secured (audio/video) content. You can still peruse the NetLibrary eBooks and Safari computing/technology eBooks, but beyond that you'll have to stick to buying (or nicking) your media. If you are a Windows user who doesn't care one way or the other about DRM and just want to be able to download mystery audiobooks from home (or if, say, your mother is) then you're in luck. Not only can you browse a healthy selection of titles, but many come with licenses that permit you to burn a copy to CD or transfer the materials to a portable device. I'm unsure as to what portable devices the transfers will actually work with, however, since an attempt with a non-DRM iPod knockoff didn't work. I was able to transfer the .WMA files to the device, but it then refused to play them. I wasn't able to test an iPod, but despite DRM support iPods lack .WMA support, so I doubt they'll work either unless OverDrive converts the files before transferring them. Zunes, I guess? The licenses accompanying the content expire after 30 days, so you only get to keep the content temporarily, in typical library fashion... so Napster this is not. Regardless, the benefits of not having to venture out to the library or try to keep track of due dates and avoid late fees make this a useful option for many and a fairly impressive evolution for an organization that seemed tied permanently to being old-fashioned. Photos: choices by ChrisJackson and drop it by sookie from the blogTO Flickr pool.